Thanh Lam is a Vietnamese singer and song-writer who has been a long-standing Diva in Vietnamese comtemporary music. Thanh Lam was born in Hanoi to music composer Thuận Yến and traditional music artist Thanh Hương. She has one younger brother, Trí Minh. At the age of 9, Thanh Lam started studying đàn tỳ bà, a Vietnamese traditional music instrument, at the Hanoi Conservatory of Music. In 1985, she switched to study Vocal Music. This was an important turning-point in her music career. After winning several singing contests, she became famous with her father's song, Chia Tay Hoàng Hôn in the National Professional Solo Singer contest in 1991. 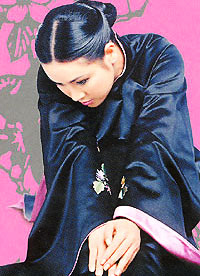 Early in her career, Thanh Lam performed with the Phuong Dong band, where she met composer Quốc Trung. She is a prolific artist, producing over 30 albums throughout her career. Thanh Lam has collaborated with various prominent Vietnamese composers and singers such as composers Thanh Tùng, Dương Thụ, Quốc Trung, Lê Minh Sơn and singers Trần Thu Hà, Mỹ Linh, Hồng Nhung, Tùng Dương and most recently, Trọng Tấn. She also worked with the Vietnamese-Danish jazz musician Niels Lan Doky on several music projects, notably the Vong Nguyet (Wishing Upon the Moon) show at the Roskilde Festival in 2006 and 2007. Thanh Lam was married to composer Quốc Trung from 1994 to 2004. The couple have three children.